OK, I'll be the first to comes right out and say this.....do we really need another version of 1st Edition AD&D? Normally I'd say "no" as we already have a plethora of retro-clones to choose from. 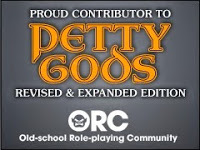 Don't get me wrong, I'm more than happy to put them here for others to possibly find useful, but I'm more excited about retro-clone supplements and not their core rules, which I'm generally not going to be using. Of course I don't really think these games really fracture the overall RPG community any because....and I could be off-base here...I think most GMs end up running their own unique game table regardless. Even when I try to run as close to the "by the book" game as possible I inevitably end up tweaking some things for ease of use. Because of these two biases/opinions/thoughts, I'm not too quick to get excited about another set of OSR rules and don't even always give them a once-over. I have at least one more ruleset in my "pending pile" so when I came across Microlite78 it didn't jump out at me. Now this isn't a review per se, but just some additional info on why you might want to pick this up and give it a look (I'm not the only one thinking these things am I?). 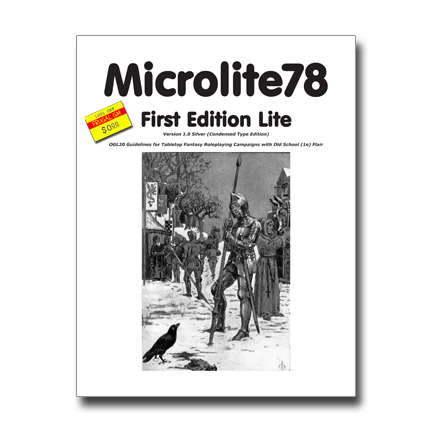 1st off, Microlite78 is a complete game and a 158 page download. Like the name implies it is a streamlined "lightened" version of 1st edition, well kind of. It isn't a clone of those rules, but more of a translation of sorts. It really struck me that Microlight 78 is probably going to be an "all or nothing" proposition for GMs and players. The "discussion" on stats is a skimpy paragraph and all the race "stuff" can fit in a single column of text easy. There isn't a lot of extraneous fluff, but it hasn't been pared down to bullet points either. I think that Microlite78 is worth checking out...it isn't a retro-clone even though if you only skim it you might not get that. The links go to the author's blog, where there is a link to the forum, that has the download link. I know it sounds confusing, but unless I provided a direct download link (which I won't do on principle) it'd be too easy to get a bit lost as the final page is a bit visually confusing. You don't have to join the forum to get the PDF.